Need a new driver’s license? When you move to a new state, you will need to go to the local DMV (Department of Motor Vehicles). That’s where you will get a new driver’s license, license plate and vehicle registration. Every state differs, but generally you will have a couple weeks to do all of this. After those weeks pass, you can be ticketed and other penalties may apply. To learn about the exact timeline you’re looking at, go to your new state’s DMV website. The DMV will charge you a flat fee to get a new license and registration. These fees will be different in every state, but you can expect them to total between $50 and $250. 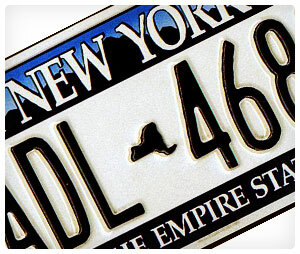 If you want a specialty license plate, you will probably pay a slightly higher fee. Because the cost of registering your vehicle should be included in the price of your move, take the time prior to moving to figure out exactly what you’ll owe. Go to the DMV’s website in your new state for details. Note: There are many imposter sites out there… the official state DMV site will end in .gov. If you already have a valid license, then your days of taking a driving test are probably over. However, you might still need to show you know the traffic laws and local rules. For example, in California, people with a valid license from a different state need to take and pass a short multiple choice exam. Also, some states require vision exams. Your car will also have to undergo a basic examination to ensure that it is road worthy. It might be best for you to take it into a mechanic to make sure it will pass prior to bringing it into the DMV and waiting in line. Many states, such as Arizona and California, require vehicles to pass an emissions check prior to being registered. Unfortunately, having the check done often requires going to an outside entity, such as an auto shop. It’s not free, and prices can range from $15 to $100. To find out if your new state requires an emissions test, check with the local DMV office or website. You might already have auto insurance, but each state has different laws. Some have stricter requirements than others for auto insurance. Just because what you have is good enough now does not mean it will be good enough when you move. You should check with your insurance carrier and the DMV to make sure you’re adequately insured when the time comes to register your vehicle. If you are moving but staying in the same state, you don’t have to deal with license plate registration or getting a new driver’s license. At least, it’s not imperative. However, you should make sure to change your address with the DMV so you don’t miss any important information or bills. Don’t like the DMV? No one does. Learn how to avoid the DMV, or at least shorten the amount of time you’re there. Over 1 million people use movingguru.com Sign up for free!